Hope. Magic. Balance. The true, holiest of causes. Eighteen-year-old Gracie Caine wants to live a simple, normal life after leaving Ariel’s Gate Orphanage. All she has is a photographic memory and a twisted club foot, but she feels good about herself until a shocking set of unexpected wings and a deadly war turn her hopeful future into something very different. She has awakened to a secret world of angels and demons, bloody war and terror. It’s a world unseen by humans, veiled in magic, inhabited by breathing archangels and ancient beings, and ruled by battle strategy, money, and power. Realizing that normal will never happen for the only known surviving pure Nephilim, Gracie is set on a precarious path burdened with the duty to protect her entire race. 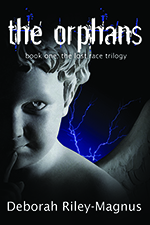 A promise was made in the beginning and the Nephilim are failing miserably. Their end is near, generating serious danger to human beings and the planet. Gracie must deal with her own fears and limitations, the diverse elements of their race, and those who wish to destroy it in a desperate effort to regain balance between good and evil. What happens to a vampire after he finally dies? Heaven? Hell? Nope, purgatory in a West Hollywood warehouse. Go figure. 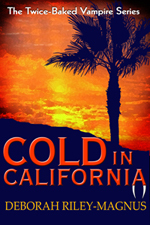 Cold in California playfully proposes that even the worst of the supernatural world gets one more chance at redemption. Twice-baked vampire, Gabriel Strickland, learns this when he’s whisked from his final demise and into a holding tank of sorts tucked secretly in West Hollywood. Sixty creatures, including other dead vampires, pixies, a legendary Navaho stick man, and bothersome leprechauns struggle together to earn brownie points (against their natures) and wait out possible centuries of purgatory. Gabriel receives dubious advice from Crudo Cushman, a controlling troll who runs the place, but there are always bugs in the pudding and he faces them all. Enter, the beautiful Dori Gallagher, who not only knocks Gabriel off his feet, but also an evil warlock who has designs on her. His life after double death is all about balance, but when menacing forces gather against Gabriel and everything he’s come to respect, it’s a fiery clash of supernatural verses supernatural in one heroic effort to save his new reality. Twice-baked vampire, Gabriel Strickland may appear to be coping well with the responsibilities his life after double-death has dealt him, but it’s only show. The struggle to earn his ticket through the Pearly Gates takes a toll when he’s directed to perform a Monkey Jump – a program designed to teach newly assigned management the skills required to do their job. To soften the blow, he takes Dori as his assistant. What he wants is peace and serenity to think things through, what he gets is startling temptation, a Soul Eater and his sidekick, Master Witch and Grand Matron, Neave Brittania Cook. One has a revenge agenda and the other, designs on Gabriel’s soul. 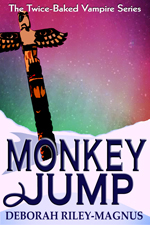 The Monkey Jump itinerary, scheduled for Phoenix and Seattle, takes a perilous detour to a north Alaskan community of the oldest, most evolved vampires on the planet. Secrets must be kept and Gabriel must protect Dori as well as his own path to paradise. Well hell, this can’t be good.